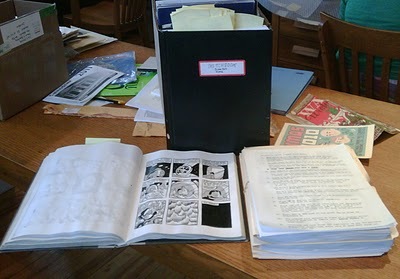 Well, I was waiting until I had my Fall 2011 list absolutely finalized but Bryan Munn of Sequential beat me to it, with announcing Seth’s Great Northern Brotherhood of Canadian Cartoonists or The G. N. B. Double C., as he should. Oh people, I have had the pleasure of reading this book and it’s a gem. I don’t want to give away too much, but it’s pure fun Seth, focusing on the cartoonists that the collector Wimbledon Green loved, and this time Seth mixes fact with fiction. (though eagle eyed readers will remember a certain Toronto retailer making an appearance in Wimbledon Green) Tom will be putting this book together so I’ll leave it to him to roll out some monthly visual teasers. So I leave you with the above, which is what a “drawn from the sketchbook of Seth” book looks like when it arrives. Why, yes, those are typed notes. No, they wont be in the book, ever!!!!! Whenever Seth sends a sketchbook it reminds me of when he informed us of the existence of Wimbledon Green. He and his lovely wife Tania were in Montreal, we are all at dinner, and Seth just casually reaches into his bag for his sketchbook and says “Oh, I have been working on this story, it’s finished” causing the Chief, Tom and I to all double plop off our chairs. Other Fall 2011 books: The Death-Ray by Daniel Clowes; Everything by Lynda Barry; The Adventures of Herge written by Jose-Louis Bocquet and Jean-Luc Fromental and illustrated by Stanislas Barthélémy; Daybreak by Brian Ralph; Pure Pajamas by Marc Bell; A Fool’s Gold by Chris von Szombathy; Nipper 1965-1966 by Doug Wright and Nancy Volume 3 by John Stanley. And just to let you all know, there’s just one more book on our Fall list we need to “dot the i’s and cross some t’s” on before annoucing, so you’ll have to WAIT another week or so to find out what it is. But it will be worth it, trust me, oh just what could it be, hmmmmmmmmmmmm……………………. This entry was posted in 2011 Releases, Publishers by Kevin A. Boyd. Bookmark the permalink.